In this picture taken on May 10, 2017, the sun sets over the center of Hanoi, as seen from the northern bank of the Red River. Vietnam’s demand for energy has increased at the approximate rate of 12% per year between 2006 and 2015, according to the Vietnam Energy Outlook Report 2017 produced by Vietnam’s Ministry of Industry & Trade. 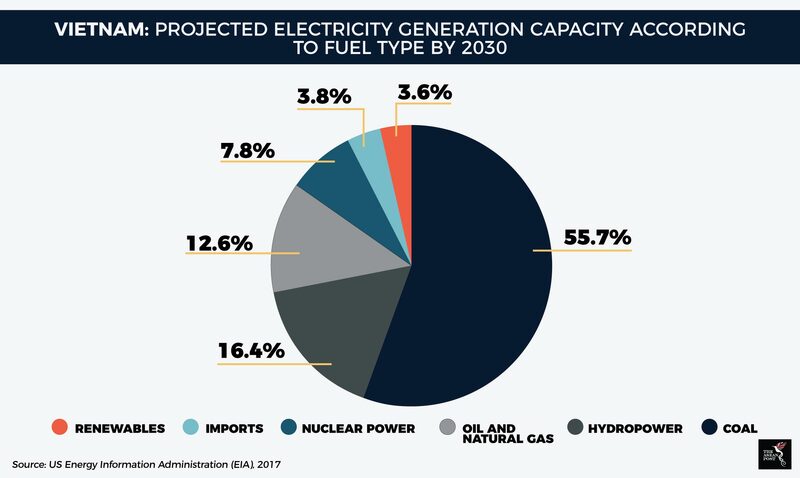 Whilst its current installed capacity is only 3.876 million kWh, it will need to produce 245 billion kWh by 2020, according to analysis by the multinational law firm, Clifford Chance in 2017. According to the Vietnam Energy Outlook Report of 2017, Vietnam is looking to renewable energy (RE) sources in order to sustain high electricity generation without incurring higher energy production costs as its energy demands increase. Vietnam curtailed plans to build two nuclear reactors in 2016 due to the high upfront costs of up to several billion dollars per reactor, according to reporting by the Nikkei Asian Review in February this year. "We will release a plan in 2018 as there are now hundreds of solar energy investment proposals following the policy changes," Tang The Hung, a senior official in the energy department of Vietnam's Ministry of Industry and Trade said in September 2017. Vietnam’s Ministry of Industry & Trade implemented Decision 11/2017 in April 2017 as a way of addressing challenges such as artificially low industrial electricity prices due to government subsidisation. Some portions of Decision 11/2017 which were outlined in June last year included the requirement for a standard power purchase agreement (PPA), and the introduction of new feed-in tariffs, fixing the electricity sale price at US$9.35 per kWh. “Vietnam has a well-developed grid infrastructure, but until very recently, a lack of feed-in tariffs (FiT) held back solar development, despite the country enjoying some of the highest levels of sunshine in the world,” opined Paul English, an executive director with General Electric Power Conversion Asia. Feed-in-tariffs refer to long-term agreements and pricing tied to the production costs of renewable energy producers, according to financial education website, Investopedia. Such mechanisms help shield RE producers from some of the initial risks of renewable energy production. Besides the need for legal frameworks to facilitate RE growth, there is also a need to create a sustainable financial source for RE development. This could be from foreign investors or could take the form of preferential loans from financial institutions. Graetan Masson, director of renewable energy advisory firm, Becquerel Institute, opined that investors should invest in transformer stations in the southern provinces of Vietnam or the highlands, but not the northern provinces. This was how transformer stations could benefit from the highest solar potential in the region. Accordingly, Ninh Thuan, a southern province in Vietnam will receive US$2 billion in investments by the real estate and energy conglomerate Thien Tan Group for the development of five solar plants in 2018. All five will have a combined electricity generation capacity of 1 gigawatts when completed. Thien Tan Group also has plans to build 20 more solar power plants in the southern provinces, the Nikkei Asian Review reported in January 2018. More investments are also pouring into the Ninh Thuan province, including a US$35.2 million investment by the Philippines’ AC Energy Inc., to develop solar projects capable of producing 300 megawatts worth of electricity, according to reporting by the Philippine Star in February, 2018. According to reporting by Vietnam News in January 2018, investors are also speeding up the construction of solar plants and connection to the national grid by the deadline of June 2019 in order to qualify for the electricity sale price of US$9.35 per kWh as set out by Decision 11/2017. Another form of investment into Vietnam’s solar landscape is via the implementation of technologies that will increase the efficiency of electricity generation by solar power. This requires effort on the part of specialised stakeholders, one example of which is General Electric (GE), according to reporting by the Vietnam Investment Review in December 2017. An example of one of GE’s efforts is the company’s technology transfer initiative, whereby partnerships with local engineering, procurement and construction contractors are formed in order to install a suite of technologies to Vietnam’s solar landscape. “GE also undertakes the responsibility of integrating every technology component into a single optimised system in order to reduce the complexity of projects,” explained Paul English. The road towards effective solar power development may still be long, but there is no shortage of incentives and policies to encourage the upward growth trend. Yet, if Vietnam is to be weaned off fossil fuels, these measures are to be seen as just the beginning. Can the Malaysia-Singapore Connect benefit ASEAN?